Smooth Milk chocolate with Honey and Almond Nougat and Honeycomb Crisp pieces. 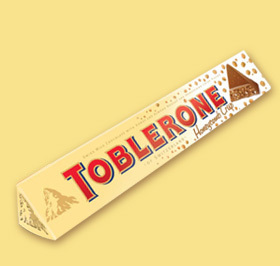 This delicious chocolate is available in a 100g bar. Ingredients: Sugar, whole milk powder, cocoa butter, cocoa mass, rice flour, honey (3.0%), milk fat, almonds (1.6%), emulsifier (soya lecithin), skimmed milk powder, flavourings, salt, egg white. Milk chocolate contains: Cocoa solids 28% minimum. Milk solids 14% minimum.